What is a patch and why would I patch my GoldenEye rom? Need Help? Visit the ShootersForever.com Forums! It's where all the experts hang out! Your Original 007 GoldenEye Rom + ips file + updated ini = custom GoldenEye N64 Rom. Does that make sense? Take your GoldenEye rom, inject it with some custom goodies like new multiplayer levels and then play it on your N64 emulator. You are here because you want to play the new GoldenEye N64 multiplayer levels. Right? You want to play levels like Block Fort, Citadel, Car Park, G5, etc, etc. Well this is the tutorial you've been waiting for! Perhaps you've heard or seen new multiplayer levels being played online. There are many many reasons why you want to know about applying IPS patches to your GoldenEye rom. The amazing new achievements in 007 GoldenEye N64 hacking from the gods like Wreck, Subdrag, Zoinkity and bmw have no doubt brought you here. These guys have brought you the evolution of GoldenEye! Expect many new GoldenEye N64 multiplayer levels to be released in 2009. The Perfect Dark multiplayer levels have been brought into GoldenEye and they haven't even dipped into the Perfect Dark N64 solo missions and converting them into multiplayer levels. I strongly suggest that you visit Subdrag's website GoldenEyeVault.com which will have the most updated GoldenEye rom patches. Trust me, if you've been away from GoldenEye N64 for a year or two you will be amazed at what's out there to play now in GoldenEye. Just think, in moments you can play bmw's single player mission Library or Zoinkity's map pack with G5, Citadel, and Car Park in GoldenEye. And of course there are many many more GoldenEye levels that you can be playing thanks to applying IPS patches. Only 10 steps to learn so let's begin! Also, if you have problems or if your GoldenEye ROM won't work properly, then I strongly recommend you read SubDrag'g GoldenEye Setup Editor FAQ. Updated Mupen .ini so that the proper GoldenEye rom names appear in your list: [Mupen ini Updated] Enjoy! Note: The downloads here will get you a zip which contains the .ips file file. The file needs to be patched to your original GoldenEye rom. [Wreck's Multi Pack A, Normal] - Play the multiplayer levels Temple*, Complex*, Caves*, Library*, Facility backzone, The Quad, Bunker i, Archives backzone, Silo Topzone (early beta! )**, Caverns frontzone, and Aztec Ruins. Normal version (default weapons and settings) with the Dr. No (no body armor in cheat menu) plus players may now choose the same character. So, if you're always fighting over who gets to be a certain character, there's nothing preventing you from both being them. NOTE: This zip contains both the normal and NGPA edition. [Wreck's Multi Pack A, NGPA Edition] - The same as the normal version except you can play NGPA version custom weapon sets and official settings. NOTE: This zip contains both the normal and NGPA edition. [Kode-Z's Villa] - Play the Perfect Dark multiplayer level in GoldenEye! Brilliant, simply brilliant! Read more. [Zoinkity's Skedar] - Play the Pefect Dark multiplayer level in GoldenEye! Even a new walkway! Watch Video here. Read more. [Subdrag's Grid] - Play the ultimate Perfect Dark multiplayer level in GoldenEye! Just released in 2008. Read more. [Subdrag's Fortress] - Perfect Dark multiplayer level Fortress in GoldenEye! Play the top floor of the Fortress. Read more. [Zoinkity's Chicago] - Enjoy yet another Perfect Dark level in GoldenEye! A very unique multiplayer level with lots of tunnels and ledges. Read more. [NGPA Edition 1.0 Block Fort]- Same as above, only this time you can play Block Fort multiplayer level which replaces Random! Yes, it's the level from Mario Kart! Read more. [NGPA Edition 1.1 Grid]- Same settings at the NGPA Edition, only this time you can play SubDrag's Grid multiplayer level which replaces Random! Yes, it's the level from Perfect Dark! Read more. [Zoinkity's Map Pack]- Play Citadel in multiplayer. Perfect Dark levels G5 and Car Park also! Read more. [bmw's Map Pack 7.0]- Surface,Depot Backzone, Facility 3/4 zone, Train, The Lab, Bottling Room, Dam Frontzone,Destroyer, plus custom weapon sets! Read more. [Banjo Kazooie Map Pack 2.0]- THIS IS NEW VERSION JAN 2008. Can you believe playing GoldenEye multiplayer in BK levels? Yep! Cellar, Furn Fun, and Tower! Read more. IMPORTANT NOTE: An IPS file can only be applied to a GoldenEye N64 rom once. Use a fresh, original GE rom when you are applying an IPS file. IMPORTANT: If you have problems installing the GoldenEye N64 editor, then read this. I get "This application has failed to start because d3dx9_30.dll was not found. Re-installing the application may fix this problem." error when I try to run the GoldenEye Setup editor. What do I do? Check your current version of DirectX: click Start > click Run > then type dxdiag in the box. You will see your current DirectX version listed here. If it is older than DirectX 9.0c [download here] you must install it whether on Vista or XP. Vista users Directx 10 is not good enough, you also need to install 9.0c. Next, if that still doesn't do the trick, download the DLL directly [download here] and place it into the same directory as the GoldenEye Setup Editor, usually C:\Program Files\GEEdit2\. I get "This application has failed to start because the application configuration is incorrect. Reinstalling the application may fix this problem." error when I try to run the GoldenEye Setup editor. What do I do? You need to install the MS VS2008 Redist DLLs [download here]. You also need DirectX 9.0c (see previous FAQ above). I get an error saying missing d3dx9_30.dll. What do I do? Download this file [download here] and place in your main GoldenEye Setup Editor, usually C:\Program Files\GEEdit2\. Enjoy this masterpiece of a program. I can't begin to tell you the thousands of things this editor is capable of doing with GoldenEye. You need to read some of the help files and tutorials and start creating some of your own GoldenEye levels. This program makes it as easy as possible. For this tutorial on applying IPS files, you will just be utilizing a tiny portion of the editors capabilities. Will this work on Windows Vista? Yes, but you need to read SubDrag'g GoldenEye Setup Editor FAQ. I will suggest keeping this easy as possible while you are new to this. So, create a new folder somewhere on your computer. You will want to name this folder as a description of what the GoldenEye N64 IPS file content is. 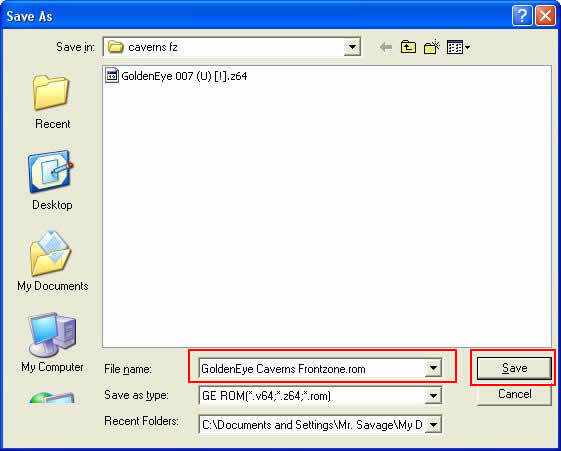 For example, if you are going to file your GoldenEye N64 rom with Wreck's Caverns Frontzone, then name the folder "Caverns Frontzone IPS Patch". Use your own judgement for naming your folder. This is self explanatory. Basically I'm telling you to make a copy of your GoldenEye rom instead of using your original. This is a precaution just in case something goes wrong during your IPS patching. Use a backup rom, not the original! 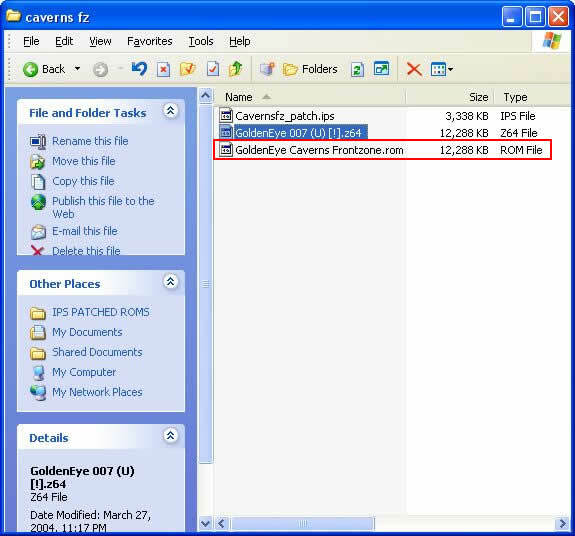 There are two main sources for you to find IPS files. The best is SubDrag's GoldenEye Vault. Browse there and find some incredible new levels! Your other source is the ShootersForever.com forums. Check the GoldenEye sections of the forums for new GoldenEye Nintendo 64 levels and IPS patch files. GoldenEye N64 IPS patches are very small files, most times less than 5,000 KB. Some are even less than 200 KB. After opening the editor, follow what I've done here. Click on "Tools" and click on "Apply IPS Patch". I've drawn a red highlight on the important portions of this step. First, click on your GoldenEye rom, then click "Open". After clicking on your IPS patch file, click on "Open". 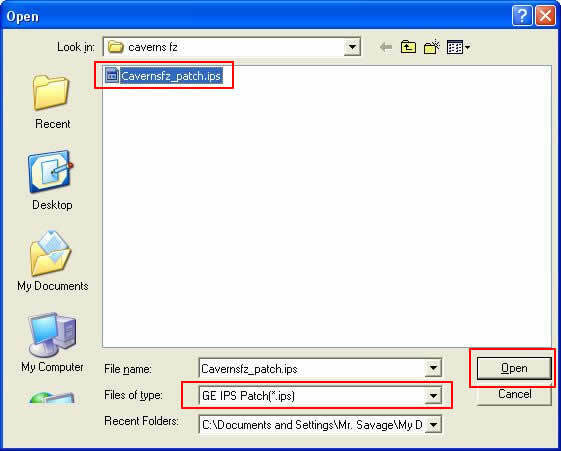 Note that your IPS patch file has the .ips extension. This step is tricky. Name your 007 GoldenEye rom whatever you want, but remember to add ".rom" to the end of the name. Notice that is the screenshot here. You should name your 007 GoldenEye rom with a matching description of the IPS patch. As you can see, I've named my rom cleary. After you've named it, click on "Save". Now, did you remember to add ".rom" to the end of your name?? 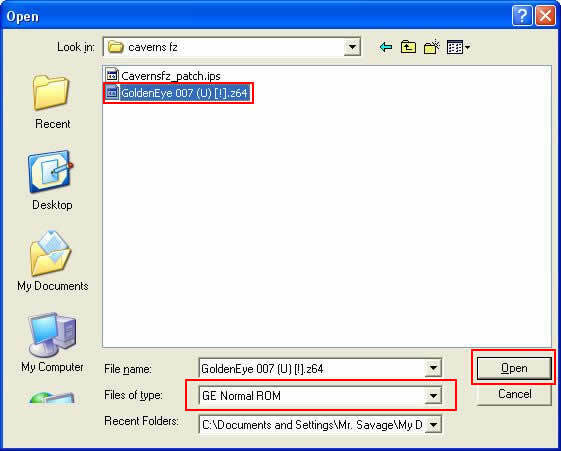 As shown here, I've used Windows Explorer to verify my newly patched 007 GoldenEye rom exists! This is an obvious step, however it's worth mentioning because your emulator will not likely recognize this new 007 GoldenEye rom. Say what? You will need to "Refresh your ROM List" regardless of what emulator you are using. Don't panic if you don't see it listed in your emulator. Chances are you will see "Unknown Rom" in your rom list. That's okay, it will play properly. It won't matter for online play with Mupen64K either. If you are hosting a game with your unknown 007 GoldenEye rom, then you will confuse other players because they won't know what 007 GoldenEye rom your are actually playing. The problem is, the emulator uses an .ini file which identifies your 007 GoldenEye roms and makes them display properly in your rom list. The .ini file is not updated for your newly patched rom. If the .ini file that comes with the emulator is updated with the IPS patched roms information, then you will see the proper 007 GoldenEye rom name listed. An example of this is "GoldenEye 007 (U) [H] (zoinkity's MapPack)". If you patch your rom with Zoinkity's MapPack IPS patch, Mupen64K will recognize it and list it properly. You can find updated .ini files on the ShootersForever.com forums soon. I will not include editing your emulators .ini file in this tutorial at this time. Be assured that the most commonly played IPS patched 007 GoldenEye rom names will be included in the updated Mupen64K .ini file. congratulations for completing this goldeneye n64 rom patching tutorial. have fun and see you online!